Susan A. (Treesh) Rettig, died Saturday at Lutheran Village at Wolf Creek in Holland, Ohio. She was 82. She leaves behind sons, Donald Jr. (Barbara), Jonathan (Elizabeth), and David (Gretchen), and eight grandchildren. Also surviving is her brother Richard Treesh. In addition to her parents, Sue was preceded in death by her husband Donald R. Rettig Sr. and daughter Rachel Gibson. 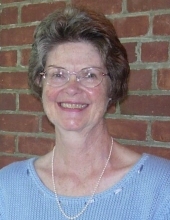 Sue was born in Toledo in 1936 to Charles and Katheryn Treesh and attended the University of Toledo. She married Donald Rettig Sr. in 1957 and the couple moved to Washington D.C. where Don served his country in the U.S. Army as a medic and pharmacist at Walter Reed Hospital. Sue loved to cook, bake, travel, and care for her family. She was a longtime member of Shepherd of the Valley Lutheran Church, and a devoted servant to her Lord and Savior, Jesus Christ. Eternally optimistic, thoughtful, patient and kind, Sue touched the lives of all who knew her and many who did not. A celebration of Sue's life will take place Friday, February 8, 2019, at 12 noon at Shepherd of the Valley Lutheran Church, 13101 Five Point Rd., Perrysburg, Ohio. The family will receive guests one hour prior to the service. To send flowers or a remembrance gift to the family of Susan A. Rettig, please visit our Tribute Store. "Email Address" would like to share the life celebration of Susan A. Rettig. Click on the "link" to go to share a favorite memory or leave a condolence message for the family.